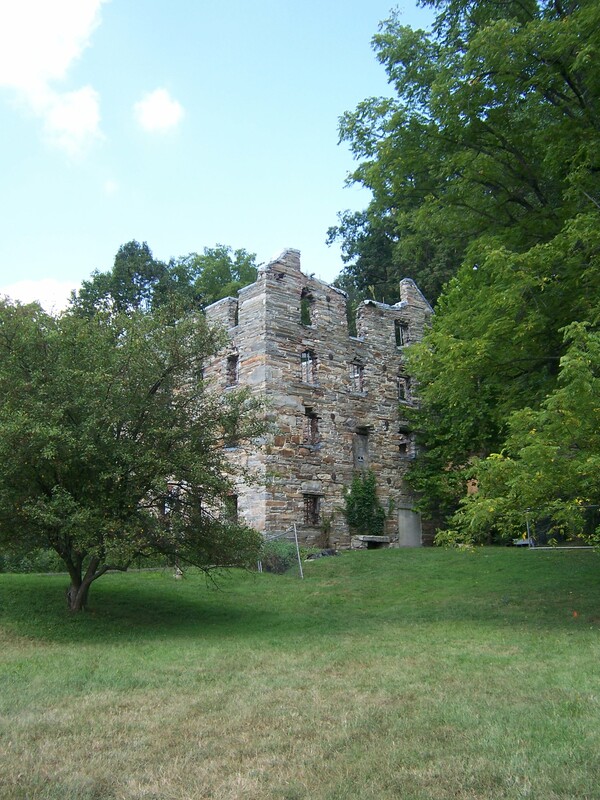 For years I’ve driven past an intriguing stone building located just off I-66 near Haymarket, Virginia. Nope, not just years – decades. Every time I’d drive by I’d think, “Man, that’s an interesting old building. I wonder what it is? Maybe one day I should stop.” And yet I never did. One day I drove past and was astonished to see that the building had been gutted by fire. That time I may have actually pulled over on the shoulder and taken a photo – I have a memory of doing so at one time or another – but I still knew nothing more about the mysterious building. 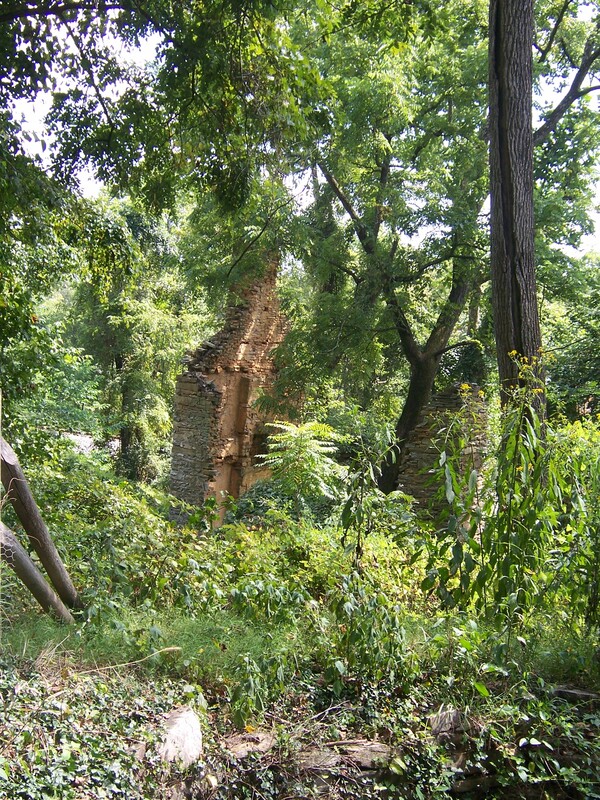 In February of this year I drove past the ruin again, and this time I thought, “enough of this procrastinating; I’m going to find out about that place.” I was fairly certain what I was seeing was the ruin of a mill, so I Googled “mill ruin I-66” and bingo! I had my answer. What I’d been looking at were the remains of a gristmill, built by the Chapman family in 1742, enlarged in 1758, enlarged again a century later, burned during the Civil War, restored in 1876 by the Beverley (or Beverly) family, closed in 1951 and burned again in an arson fire in 1998. At eighty-three feet (seven stories), it’s believed to be the tallest stacked stone building in the United States. This Labor Day weekend, John was less inclined than I to get out and about, so I decided to make a solo jaunt out to the country to see the mill at last. Although the mill is clearly visible from the highway, you have to know where you’re heading to actually get there – fortunately, I was running a GPS program and found the place without a problem. 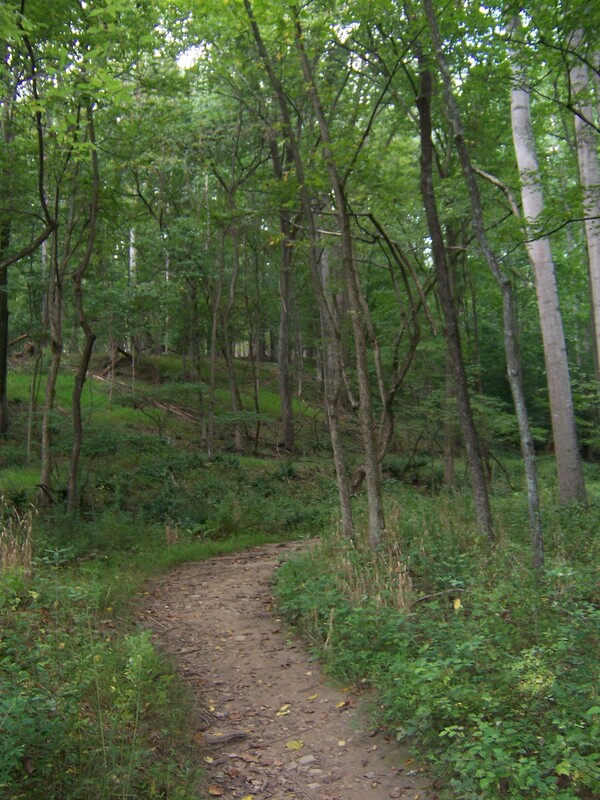 I was surprised to find that it’s cheek by jowl with the Bull Run Mountains Conservancy, which has a number of nice hikes in the area – as evidenced by the numbers of runners, dog-walkers and day hikers parked in the area. Most of them were headed onto the trails, but I parked right by the mill gates, grabbed my camera and walked about a quarter mile to the ruins. I was a bit surprised that everything was wide open and unattended (although I did see a police cruiser come through at one point). I was able to stroll around the entire site – nothing was gated off or locked, although there were a few warning signs. I stuck my head into the Stone Mill Store, which was empty but for a couple of busy wasp nests, so I didn’t linger there. When you step into the ruins, you immediately see two things: a lot of very interesting gears, and overhead, an internal reinforcing framework. The juxtaposition of the steel beams against the stacked stone is surprisingly pretty – almost like modern sculpture – and the rusting gears and other mechanical detritus add interesting textures. Up close the mill doesn’t seem quite so imposing as it does when you pass by on the interstate, but it’s still impressive. I was pleased to see that it hadn’t been trashed or graffiti’d or otherwise defaced. The weeds growing out of cracks in the walls and the vines winding in through windows made an even more picturesque site. Normally ruins like this make me feel a bit melancholy, but the beauty of the day – sunny, with fluffy white clouds – combined with the obvious care that’s going into the restoration, made me happy. I wasn’t dressed to climb up on things and probably wouldn’t have, anyway – it seemed disrespectful, somehow – but I did poke my camera here and there to get photos. Broad Run, the stream that runs past the mill, seemed very low and muddy, so I didn’t feel the urge to plunge down the embankment and have a look at it (normally I can’t resist running water – I always want to go paddle in it). The oddest part about taking these photos in this rustic setting was hearing the traffic roaring past on the interstate. 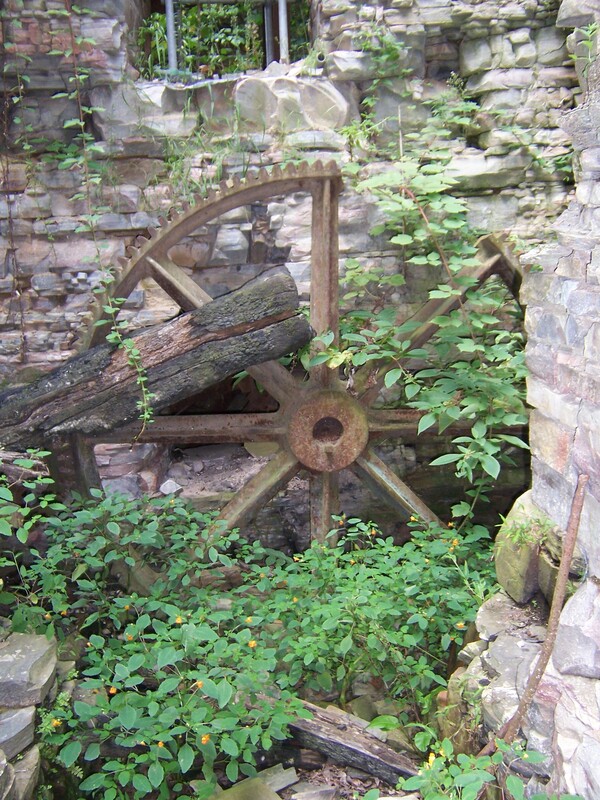 The mill wheel, or what’s left of it. I had to stand at the edge of the embankment and stick my camera out over the stream below to get this shot. A big gear, with a burned beam leaning on it. There was a lot more gearage and bits of mechanism scattered all around the site. 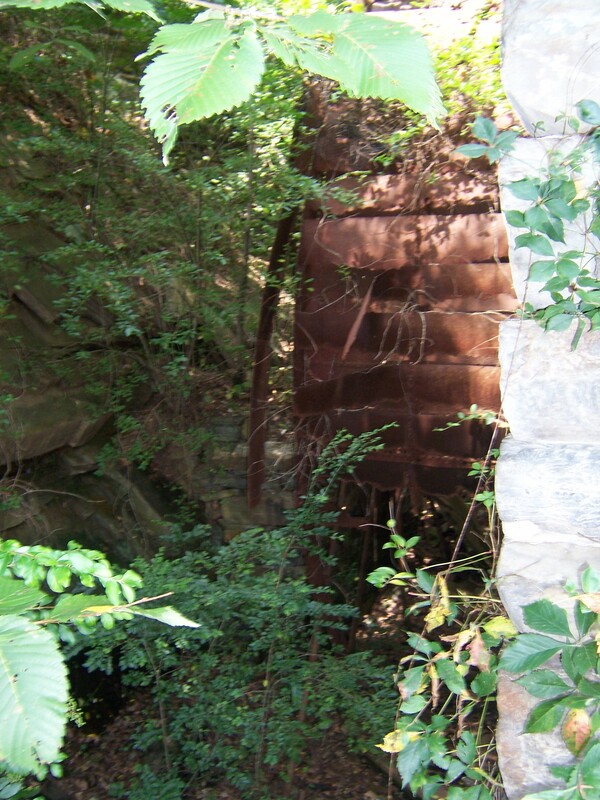 Not far away from the mill ruin was a large, overgrown area where I found a cache of rusted parts that were clearly some of the interior workings of the mill, and there were foundations here and there of what must have been outbuildings. You can’t really get around the back of the mill; it’s fenced off and there’s a railroad track, still in use, that goes right past it, which must have been handy back in the mill’s working days but seems uncomfortably close now. I headed back out to my car, but the sight of people heading off to hike was enticing. I wasn’t dressed for hiking (jeans and sneakers), but a look at a map at the trailhead kiosk showed me that there was a trail that ran right behind the ruins. 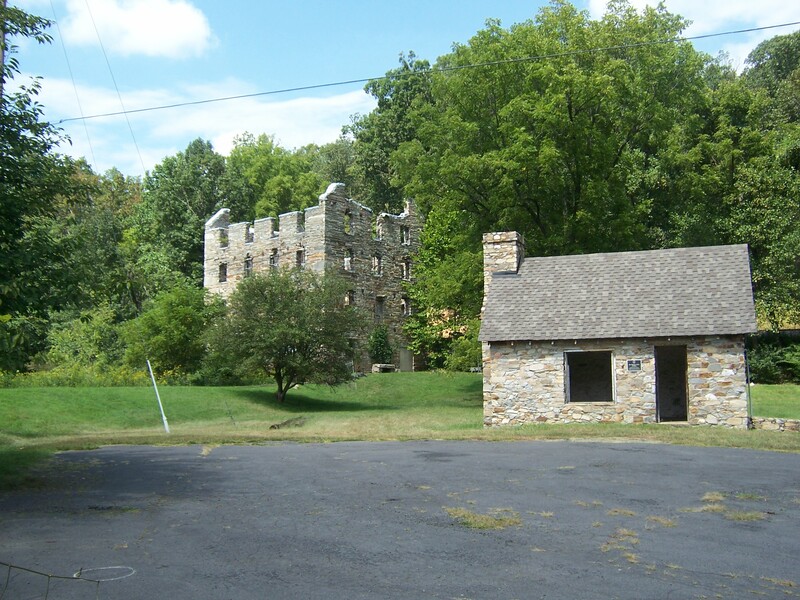 I figured I’d get some good views of the mill from behind, so I entered the Conservancy, crossed the railroad tracks and bore west along the Fern Hollow Trail. 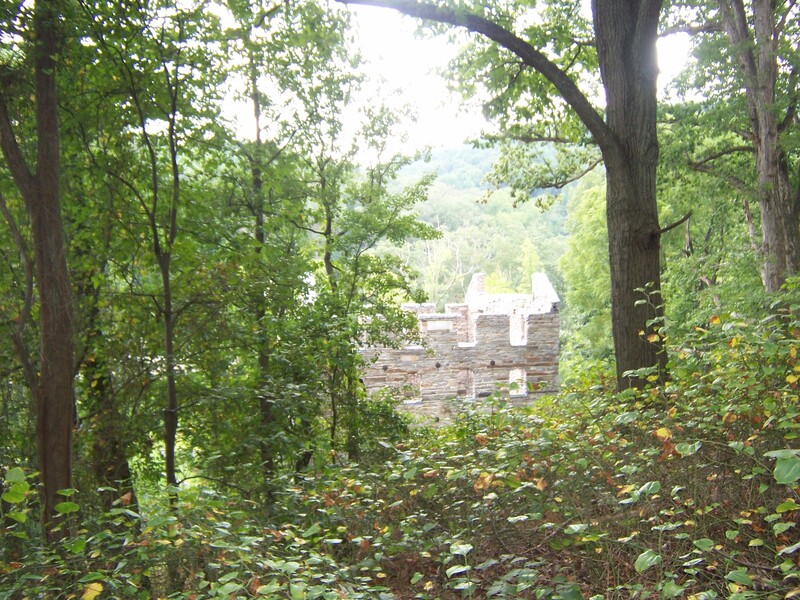 The trail had a gentle rise, and before long I found myself looking down at the mill again.The ruins looked even smaller from above and had more of a ghostly air. I thought about making my way down closer, but without proper footgear I was afraid I’d fall (the wife of a friend recently took a tumble down a much smaller embankment, resulting in a hospital stay and months of therapy ahead, which made me even more cautious). 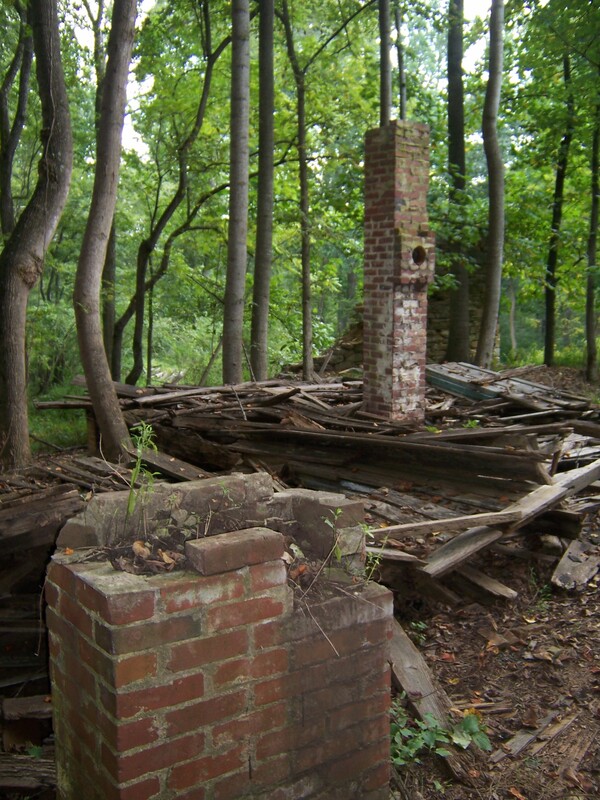 The ruins of Meadowland, the Chapman family’s home. Built sometime in the mid-18th century, it was destroyed by fire around 1880. The stone lip in the immediate foreground marks the edge of a stone-lined pit, probably used for ice storage. I thought I might continue north to a scenic overlook, but at the intersection of Fern Hollow Trail and Chestnut Ridge Trail I encountered a couple on their way down. They told me that although the view was pretty, it was a pretty steep hike, so I decided to head back to the car. I took a little different route down, one more populated by hikers, dog-walkers and runners. I was sorry I hadn’t brought a bottle of water with me, and was glad I had left the remains of a fountain drink in my car – it was watery from the melted ice, but still refreshing. 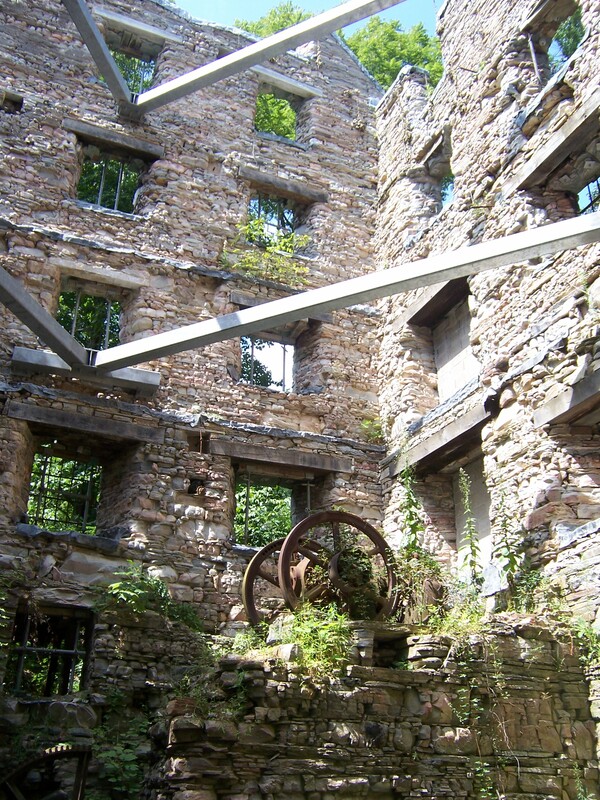 I’d like to make a return trip to the mill ruins in the fall, before my theatrical season gets going and I have no time at all. I bet it’ll be pretty with all the autumn colors, and a lot cooler for an uphill trek. If I wear proper hiking clothes, who knows? maybe next time I’ll make it up to the scenic view! One visitor shares her visit to the Chapman – Beverley Mill.